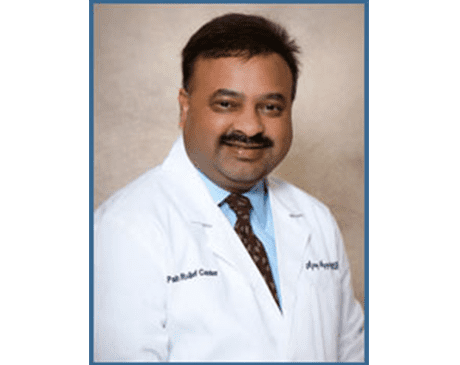 Ajay Aggarwal, MD, is a board-certified anesthesiologist and pain medicine specialist serving as medical director at The Pain Relief Center in Bay City and Lake Jackson, Texas. Dr. Aggarwal specializes in ultrasound-guided techniques and opioid addiction treatment. Dr. Aggarwal earned his medical degree at Dayanand Medical College & Hospital in Ludhiana, India. He went on to complete an internal medicine residency at Grant Hospital in Chicago and an anesthesiology residency at the University of Medicine and Dentistry of New Jersey in Newark. During his surgery anesthesia training, Dr. Aggarwal developed a passion for interventional procedures to help keep his patients pain-free. As a seasoned pain management specialist, Dr. Aggarwal brings a comprehensive approach to pain management and spinal pain care. His goal is to rely on the latest and most sophisticated interventional and nonsurgical techniques available to reduce a person’s pain and help get them functional again as quickly as possible. At The Pain Relief Center, Dr. Aggarwal and his team work closely with each patient to design and implement a personalized and customized approach tailored to their unique needs. Dr. Aggarwal wants the best for those in his care, and he won’t stop until he gets it right and sees a smile on every patient’s face. In addition to his work at The Pain Relief Center, Dr. Aggarwal serves as director of anesthesiology and pain management at Matagorda Regional Medical Center in Bay City. He’s also a member of the American Medical Association, American Society of Anesthesiology, Texas Pain Society, Texas Society of Anesthesiology, and Texas Medical Association. When Dr. Aggarwal isn’t caring for patients, he enjoys traveling and spending time with his wife and two children. He’s also actively involved in the Matagorda Regional Medical Center Foundation.